This New Year newsletter/blog is a bit tardy…. An 8 city China tour in December, immediately followed by the holidays where our expectations as parents kick in, and then concerts in early January with eight major pieces to prepare, distracted us a bit from sending out a timely message! It’s pretty hard to believe that we officially became Duo Concertante some twenty years ago this season. Here (at left) is one of our very first promo shots taken by Sheilagh O’Leary which we used during our very first tour to ON. 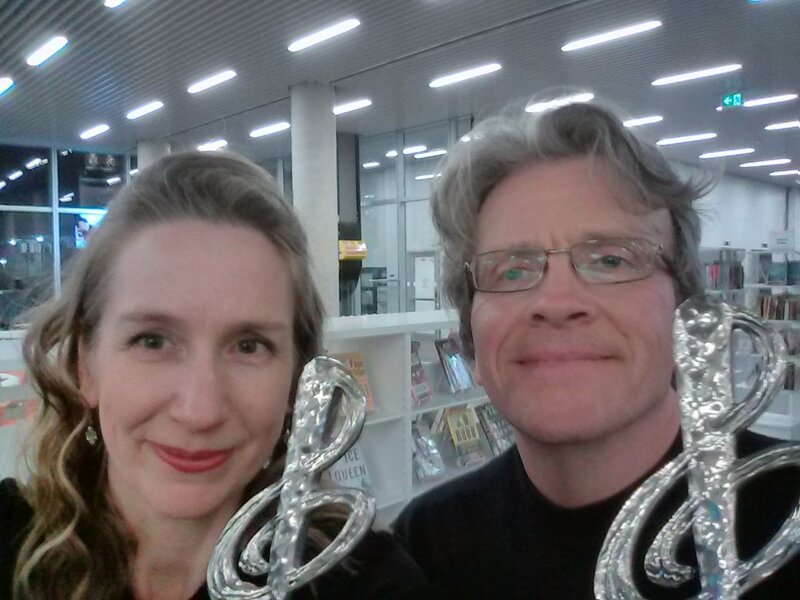 We’ve returned to many of these venues over the years, which is always meaningful, and one of these – the Kitchener Waterloo Chamber Music Society – where we’ve played over a dozen time, will see us next week with our clarinettist friend Christine Carter. 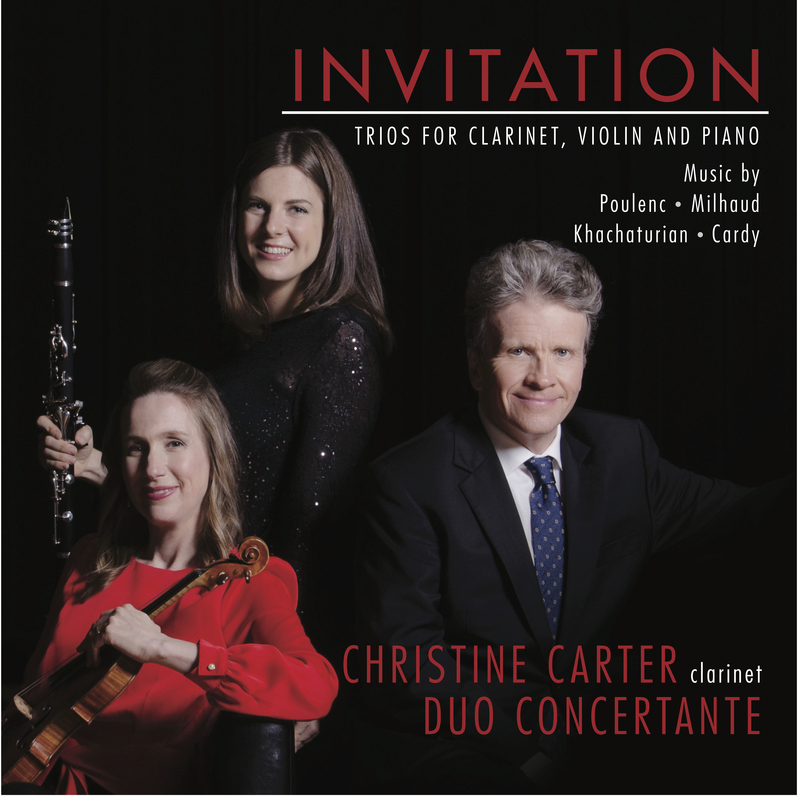 And we’ve just released with her Invitation, an album of trios by Milhaud, Khachaturian, Cardy and Poulenc which we’re pretty proud of. So far, it’s been a busy and fun 2018-19 with over 35 recitals throughout Canada, US, Germany, the U.K. and the far east. China was especially memorable with its gigantic cities, lovely halls, (here we are in Beijing) friendly people, and, of course, amazing food. A typical day on the tour was: get up at 6 am, go to the airport, fly 2-4 hours to another major city, go to hotel, go to hall, warm up, play concert, go to hotel, sleep and repeat. (We were a tad worried about the political situation between Canada and China which intensified as we were there (and continues to be heated), but thankfully we made it home. Our wonderful tour manager ran things like clockwork – from planning complicated itineraries to keeping us healthy and fed with fabulous, fresh food. Since the beginning of Duo C, playing new Canadian music has been a “thing”. This year we commissioned two new pieces – Frisson by Randolph Peters and a major work by Melissa Hui will follow in 2019. These pieces join the 35+ plus works that we’ve commissioned (often with the assistance of the Canada Council) and premiered since 1998. 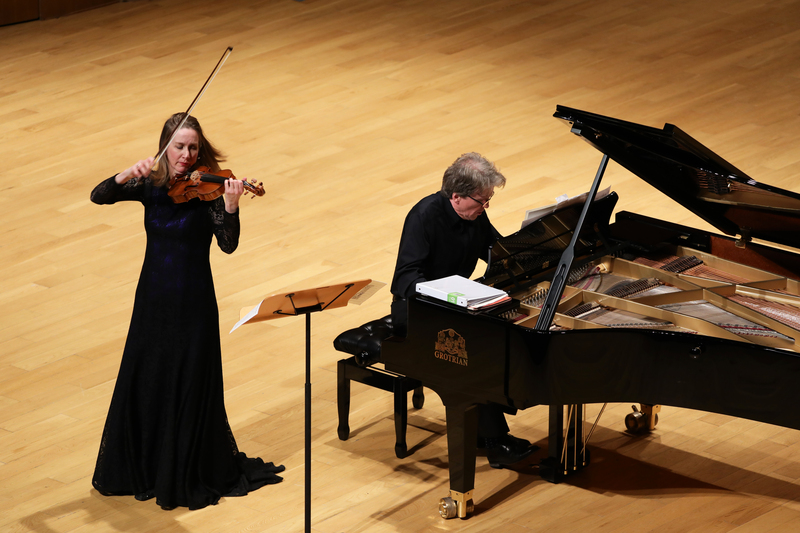 We are thrilled that many of these have become a regular feature of new Canadian violin and piano programs by a younger generation of players. 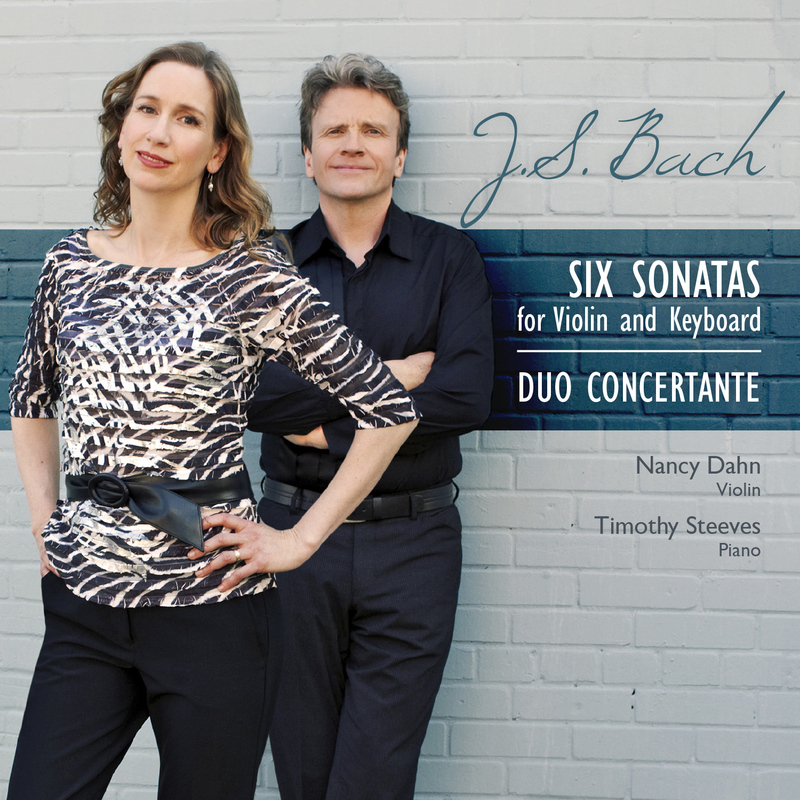 Over the years, we’ve also loved focusing on complete cycles… first all the Beethoven sonatas, then Bach’s. 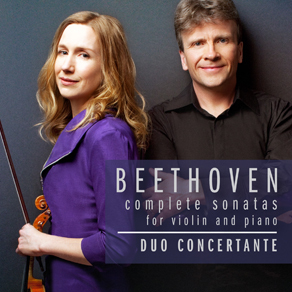 Recently we’ve been recording the complete works for violin and piano by Schubert. Summer 2018 we put the Fantasy (Is that most difficult but also most beautiful work ever written for violin and piano? ), Rondo Brilliante, and D major Sonatina “in the can” and this June we will finish up at the Glenn Gould Studio with the A major Sonata and 2 other Sonatinas. It’s been a super rewarding project and such a treat to play these exquisite pieces. Another 20thanniversary milestone approaches in a year and a half – that of the Tuckamore Festival where we are Artistic Directors. This festival has grown from a two-week festival of four concerts to one with 30+ summer events and school concerts and other outreach activities that spill into the regular season. 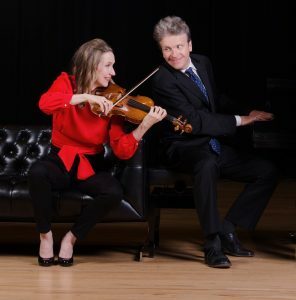 With the guidance of a great manager and excellent board, Tuckamore has been able to bring world class artists to audiences in Newfoundland as well as provide exceptional opportunities to over 350 emerging musicians and composers. 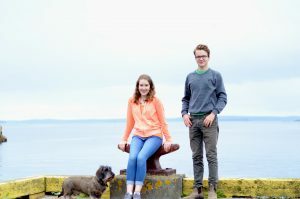 This summer, as part of Tuckamore, the Duo looks forward to travelling to central Newfoundland with actor/playwright Robert Chafe in a musical dramatic work that celebrates NL’s joining Canada 70 years ago. 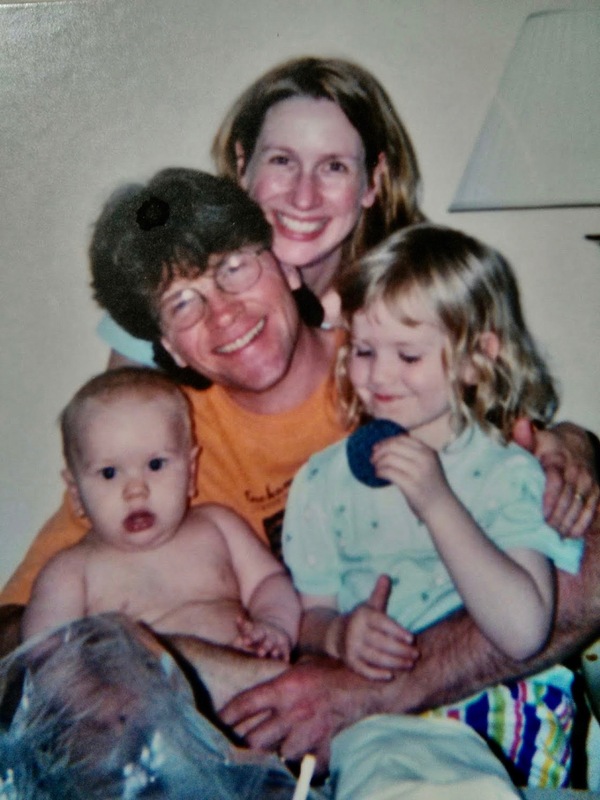 The most noticeable change for us after twenty years is that instead of touring with a baby and toddler, we share our lives with two pretty darn awesome almost adults, Clara and Sasha. They’ve always incredibly good sports about tolerating the craziness of our lives and we’re so glad they don’t mind the fact that they are being able to hum every major violin and piano work by heart. Clara and Sasha (with Buzz) in Briggus NL in 2018. So far we’ve commissioned over 35 new Canadian works and we usually program one of them on every recital we play. We also have recorded 3 CDs devoted entirely to new music written for us. Except for some family members who can be relied upon is to say things like “Are you going to be playing any of that weird music on that concert?”, we’re never quite sure what the reaction will be when we put a new work between some Bach or Beethoven. Ditto for when we make a record of all new Canadian pieces. 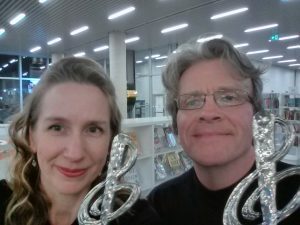 So we were doubly thrilled when Incarnation was not only selected by CBC as one of the top ten classical albums of the year (and that’s a pretty broad category mind you) but also won Classical Album of the Year at the ECMAs. Thanks goes to the five great composers – Chan Ka Nin, Denis Gougeon, Alice Ho, Jocelyn Morlock and Andrew Staniland – who inspire us with their bravery (yes, bravery. It takes bravery to be a classical composer), imagination, beautiful art, and originality. 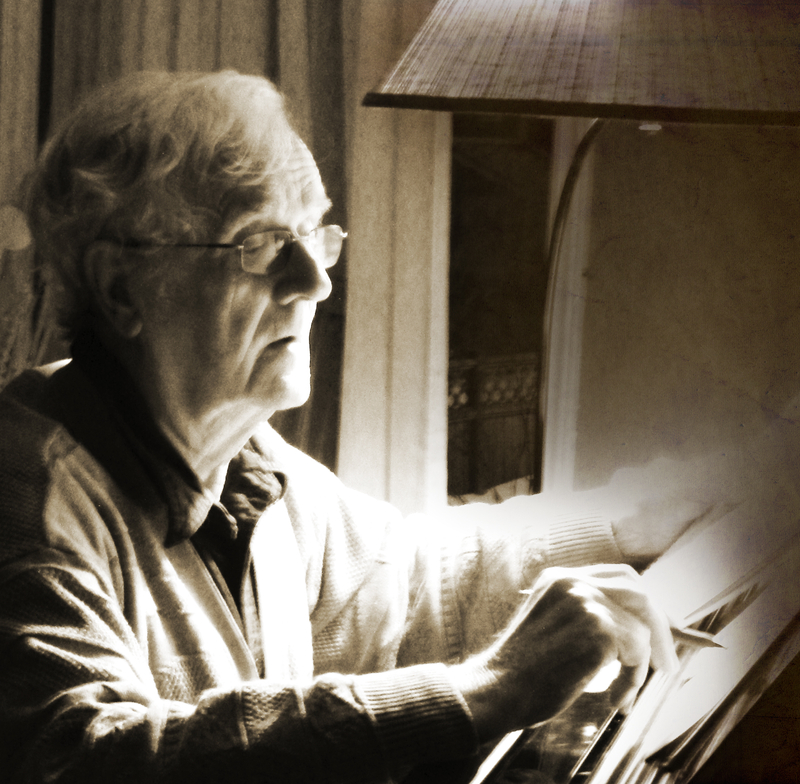 We recently added another wonderful new work to our repertoire – Frisson – by Randolph Peters. Usually when we commission a new piece, we’re sent the music and then if we’re lucky the composer might hear it at the premiere. But most times there’s not too much collaboration. This time, however, Randolph and the Duo thought it might be neat to document the process of writing and learning a new piece. We created what we think is an interesting video using material from interviews, the score, a workshop with students at Memorial University, and, of course, the premiere performance. By the way, the word “frisson” means “a sudden strong feeling of excitement or fear” and describes the goosebumps you might feel at a climatic, intense musical moment. Randolph gave himself the challenge of trying to write a piece which causes a frisson moment in the listener. So you know, that is suppose to happen at about 12:17 in the video. And if it didn’t do that for you at this premiere performance, we promise we’ll nail it when we record it on our next all Canadian CD! We got a lovely Holiday surprise when our all-Canadian CD Incarnation was recently picked by CBC as one of the top 10 Classical Album of 2017! We are delighted beyond words! Thanks to the composers – Chan Ka Nin, Alice Ho, Andrew Staniland, Denis Gougeon and Jocelyn Morlock – for writing us such fabulous pieces and to the recording team of David Jaeger and Dennis Patterson for their amazing work in the booth. 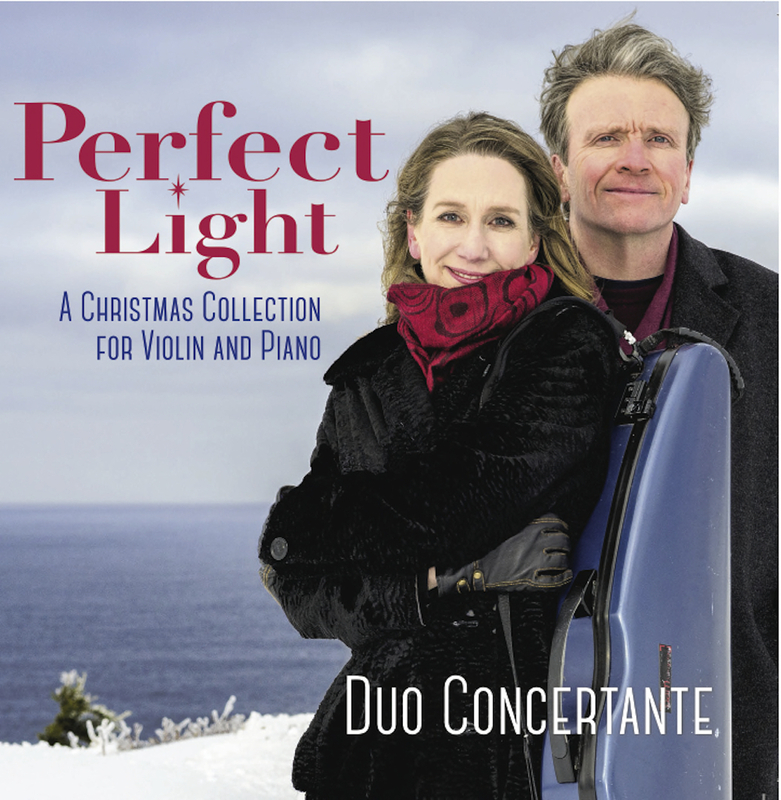 As 2017 comes to a close we’re so pleased to share our newest CD – Perfect Light – a collection of original holiday arrangements written especially for us – and clarinettist Christine Carter who joins us on five tracks – by Clifford Crawley. Creating this CD was an extraordinarily meaningful experience as it was the last project Cliff worked on before he passed away in February of 2016. We developed a special friendship with Cliff over the ten plus years he lived in St. John’s. He had retired from teaching composition at Queen’s University and followed his wife, renowned ethnomusicologist Bev Diamond, when she joined the Memorial University faculty. 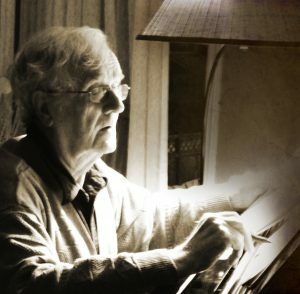 Cliff took no time in becoming a vital part of his new home, embracing opportunities to write for numerous St. John’s musicians with vigor, skill, and great generosity. 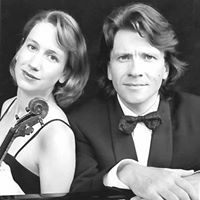 The Duo’s first collaboration with Cliff was It Takes Two – an encore CD designed to showcase both the violin and piano equality. Cliff seemed to effortlessly produce these 14 wonderful and witty arrangements of opera arias, jazz tunes, musical numbers, and classical hits, recasting these well-known pieces in a fresh and imaginative way. More requests followed – ballet arrangements, original pieces – all produced with speed, enthusiasm, tremendous creativity, and big-heartedness. Our final requests of Cliff turned out to be these Christmas arrangements. It is not an easy task to arrange vocal music, where the text can change with each verse, for instruments only. Yet Cliff found a way to bring these tunes alive with just violin, piano, and, now and then, a clarinet. Often using the song as merely a starting point for an original fantasia, he cast new light on these old favorites. He worked on these up to the end of his life, completing them all but for “In the Bleak Midwinter”, which we recorded as a fragment only. We are ever grateful for his treasured presence that lives on in our hearts through all these works, and we will always remember his kindness, wit, wisdom, talent, and generosity. This CD is dedicated to his memory.